Google is now taking applications for a limited preview of a new app called Google Classroom — a tool that brings learning management functionality to the Google Apps for Education suite. According to Google Apps for Education Product Manager Zach Yeskel, Google Classroom is designed "to give teachers more time to teach [and to] give students more time to learn" by helping them avoid "some of the busywork" that's part of the process of teaching. Yeskel said Classroom has been piloted in about a dozen schools around the country so far, including institutions in New York, California and Illinois. When teachers open the Classroom app, they're presented with a screen displaying their classes on cards, which give a summary of open assignments and other details. They can then click on a particular course for managing assignments and grades or performing other tasks. When instructors create assignments, Google generates folders within Google Drive to organize them automatically. 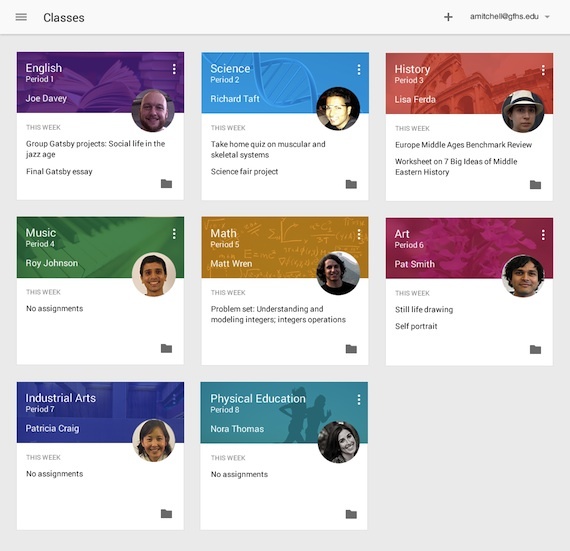 The Google Classroom home screen (prerelease) includes class cards that provide a summary of open assignments. Students who use Apps for Education can see which assignments are due for any given class by visiting their Classroom home screen. The new tool also adds a button in Google Docs that let's them submit their assignments with a single click. Their work is automatically associated with a instructor's assignment and filed to the appropriate assignment folder when they click the "turn-in" button. K-12, college and university educators can apply now to be a part of the preview. It isn't clear how many teachers will be accepted as part of the preview, but those who are accepted will be notified within about a month. A sign-up sheet is available for educators. The final Google Classroom product is expected to be released globally in 40 languages by September, at which point it will be available to all institutions that use Google Apps for Education. (The suite is currently in use by about 30 million instructors and students.) Google Classroom will be a core app within the Apps for Education suite and will be available for free upon its formal launch. Complete details can be found on the Google Classroom portal, which just went live this morning. To sign up for the preview, educators should visit classroom.google.com/signup.